Around eight or nine months ago, I was diagnosed with a basal cell carcinoma on my chest. It looked like a pimple (with a thin crust on top), but it felt like something had taken hold of me, and wouldn't let go. The doctor recommended surgery, but he also said that there was no time urgency. Since I knew that both surgery and chemical creams have a risk of leaving bad scarring, I decided to research natural alternatives. I called a friend who is very knowledgeable about alternative medicine. He recommended that I try pure (no aluminum) baking soda. The idea behind this is that baking soda is super alkaline, and cancer cells cannot live in an alkaline environment. He said to make it into a watery paste with pure water and apply it to the area every morning and every evening, covering it with a wet piece of gauze to keep it wet as long as possible, then taping a dry piece of gauze on top of that. He said I should notice it working in about ten days. I did as he said, and it took about a week before I noticed a difference. It began to sting a little bit, and I could actually feel its grip lessening, and I could see the puffiness that surrounded the "pimple" had flattened. I knew that was a good sign. After that, the lump itself seemed to grow daily, which didn't worry me, as my friend had said that I could be sure that under the skin, it was actually four times the size that it looked. Each day it grew larger, as the baking soda pulled it out from under my skin, and as it did, it looked redder and angrier, and the burning pain increased. As it grew, the surface became cracked, even though it wasn't dry, but wet. The cracks were red and they bled a little. I found blood on the gauze each time I removed it. After about three weeks, it looked really ugly, which was scary on the one hand, but comforting on the other, as I knew it was a sign that it was working. I remember thinking that it felt like there was a battle taking place, right on my chest, between the good cells and the bad. After four weeks, I developed a blister-type rash all around it, which my friend assured me was my skin's reaction to being in such an alkaline, wet state, for so long. A few days later, when I removed the gauze, THE THING CAME OFF! It sloughed off in a kind of mushy mess, and left somewhat slimy remnants of itself. I continued the treatment until the remnants were all gone, except for a sizable lump, which was smooth and clean. At this point, I stopped the treatment, because the surrounding skin really needed to heal from the bumps that had developed due to the moist, alkaline environment that the baking soda had created. The remaining bump shrunk every day, until it disappeared totally within a month, LEAVING NO SCAR. Now, 7 months later, I cannot tell exactly where it was. Wow that is great. The only thing you used was baking soda. Interesting. Thanks for posting. a) Would this do it as pure baking soda? b) Pure water, would filtered water do it? If you could post/share anything else regarding this treatment that you successfully used to heal yourself of your BCC on your chest, that would be awesome. 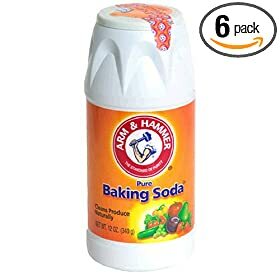 Has anyone else used baking soda??? I have been using cymilium for 8 weeks now, with no noticeable success on a bcc on my upper lip. I'm very sorry that I didn't see these replies until now. Also, someone asked me a question directly, but didn't leave a reply address so I'm posting my response here. Shafah, I did not use Arm & Hammer, because I believe it has aluminum in it. I went to the health food store and got baking soda that is posted 'aluminum-free'. I'm sure filtered water would be fine. I was staying in a place where we had well water, so that was nice and clean. First of all, my alternative health care provider thought that the fact that I eliminate all animal products from my diet was an important part of the healing, and helped it not to get any worse than it did. Baking soda was the only thing I used. I kept it on constantly, except for showering and maybe to let it dry out every once in a while. The gauze covering the bcc pretty much stayed wet between changes. If anyone has any other questions, please send them to me directly and I will be happy to respond. I wish everyone the best. Thank you bakingsoda for your reply. Sorry for not replying earlier as I have been very busy with things. is it ok to treat 2 spots at the same time with the baking soda method? How was the pain while you did your treatment Bakinsoda? Thanks again for any/all your feedback. I had a mole that was uneven in color, about the size of a pencil eraser, and it was starting to itch and burn. Frightened me. But I have no medical insurance (so I have no diagnosis), but I am highly suspicious of western medicine anyway. I found Edgar Cayce's suggestion for mole removal online. Make a paste of baking soda and castor oil and apply to the mole. I have been doing this twice a day for about ten days so far. At first, the mole burned a lot. Then an area about five times the size of the mole became very inflamed. It bled and oozed and crusted. I stopped the treatment for a couple of days to give my skin a rest. Most of the redness has gone. A lot of scabbing has peeled away. I have a small scabbed area still remaining. I am going to start applying the castor oil/baking soda mix again tonight. I tried the baking soda and wanted to let people know my results!!! I had been using Ammonia and Aloe Vera which almost got rid of it but it would come back again and again. I started cleaning it will the Ammonia & Aloe and then putting the baking soda on it at least twice a day as it was on my cheek. It is gone!!! So excited!!! It took about a month but it is flat and there is still a small mark where it was but it is going away a little more each day. Thanks so much for posting your experience!!! Hope it works for many others!!! I have been trying a mixture of baking soda,peroxide, and ammonia on my upper lip for about a month now. My area is about the size of a quarter,it looks horid, it's scabby,bleeds, painful, ect. I would put the mixture on it 2x's a day, then clean it with peroxide and put Neosporin on it inbetween to help it not dry out and bleed so much. It would seem to clear up some, least not look like I was diseased, but then it would seem to get angry and really flare back up. I think the mixture helps keep it at bay for abit, but won't get rid of the cancer. I have my Petty Spurge seeds that just sprouted so am waiting on those for that treatment. Still using the other mixture for the time being to try and hold it from blowing up and spreading any more. Wish it worked on me but I'm not seeing any results of it attacking and killing the cancer. if any of you live in a medical marijuana friendly state I highly recommend just using cannabis oil.. it is so non toxic to healthy cells that you won't get a rash or anything. Hello! Thank you for posting this! I used the combination of baking soda and castor oil (still using) and I reapply a new past 3-4 times a day and cover it with a band aid all day, except for showers. I also rinse it every time I make a new paste. I noticed the skin around the area I'm treating is becoming hard and I noticed slight blistering today. It's getting more red, but all of the brown is going away. I was wondering if the hard are might be the inner mole/cancer underneath and are these reactions normal? I don't have any pain or discomfort. I just wanted to be sure I was doing the right thing and this seemed like the place to ask. As a side note, this was a mole that was originally removed as a child and then grew back. Originally it was flat, and then grew back slightly raised but barely noticeable (though the same size as the original). I've been using a bicarbonate of soda/coconut oil paste for about 3 weeks now on a BCC (fully diagnosed through biopsy) in the side of my nose, quite high up near my eye. The pearly edges have definitely flattened, although redness is becoming more evident around the site of the tumor itself, making it appear bigger and angrier, some of which is encroaching worryingly close to my eye. However, I am convinced that the tumor is not a part of this extra 'redness' rather it is alkalinity and slightly abrasive nature of the paste I am applying...which I am doing about 6 times a day. On the 26 April (yesterday), I had my first appointment with my surgeon (whom I met for the first time) to assess the tumor and discuss removal procedure with. When he looked at the tumor with his hand-held illuninated scope, I thought it was a little odd...he studied and studied and studied it. I sensed he might have thought something about it was odd. I started to worry. Eventually he said, "Bit of an odd one, this....I actually can't see any real distinctive edge/perimeter so I can't really guauge the true extent of the abnormality". It was then that I told him of my home-brew remedy. After I explained to him I was using it because of information I had gleaned from the internet about tumors not liking alkaline environments, he kind of smirked dismissively saying, "Don't believe all you read on the internet. YOur tumor will need to be surgically removed." He was quite a nice, chap..almost endearing actually. In fact, after a little internet research, I discovered he is an expert maxillofacial surgeon, one of the best we appear to have in the country. But this leads me to ask the question....He maybe great at facial reconstruction prior to accidents or surgery, but what does he actually know about CANCER itself? Thing is, I feel sure that my paste is doing POSITIVE things to the area of the tumor itself...there is no bumps on the edges anymore, despite the extra redness. I am actually hoping that my surgery is delayed long enough for me to keep applying my paste for another month and that is what I am going to keep doing. But obviously, on the flip side, I don't want to add further complications to any subsequent surgery I might still have to have. Have heard a fair few positive things said with regards Basal Cell Carcinoma being curable with bicarbonate if not too extensive. Can anyone here give me any reassurance that this might be the case, or should I stop using the paste straight away as my surgeon advised?? Hi robbyh1, welcome! There is no problem bumping an old thread as you did. You do have a dilemma in that your coconut oil and baking soda remedy is working slowly with no guarantee it will finish the job, although it might. It seems like a good combination with low risk for doing harm. My theory as to why baking soda remedies sometimes work is that the alkaline environment allows pancreatin enzymes to do their natural job of eliminating cancers. Adding pancreatin enzymes (available as a supplement) to your topical remedy may speed things up and is something to consider. Although baking soda provides the optimal pH environment for pancreatin enzymes to work effectively, household ammonia is more alkaline, penetrates skin better, and is another thing to consider adding or substituting for baking soda. Just be careful not to get any ammonia in the eyes as it can cause permanent damage. Always have a plan ready to wash your eyes with water immediately if any ammonia accidentally contacts the eye. The baking soda girl who started the craze blogging about how she cured her grandmother using the baking soda paste method kind of forgot to do a followup that her Grandma's skin cancer came back. I used her method for a few weeks and it started to become REALLY painful...That's when I reached out to her and discovered that her Grandmothers skin cancer came back and she was re treating. This all said for sure it does eat away at it slowly and Dan's suggestion of using ammonia as a carrier and adding Pancreatin enzymes would probably help the method a lot. In the alternative world hands down Bloodroot Paste is the current serious approach and there a re several groups on facebook with hundreds of users for support. Just vinegar ( acetic acid) will make the effected area red... When your doctor says he can't accurately "see" where to stop he's 100% right. Of course he's meaning what he as an expert in surgery can see if you hadn't done anything to change the look...But the truth is there is not a surgeon on planet earth that can accurately see all the effected area or where the cancer ends without the use of Mohs Microphapic surgery techniques ( definitely sounds like this is not what he is planning on using) if you didn't do anything as he is asking and he just guesses his way through without using the Mohs technique, re-occurrence is much more likely than if you can get Mohs done. You didn't post pictures so it's not possible to say what I'd do if I was you but if you post em I'll chime in on my perspective. Thank you both very much for your prompt, informative and supportive replies as well as suggestions of alternative remedies. Since I made my previous post only a few days ago, my BCC has taken on a completely different look. Almost all the redness has gone and after giving it a rest for a day from the frequent applications of my soda paste, a thin layer of skin off the tumor site dried up and flaked away. In fact, if I hadn't have had the biopsy done (which obviously left a small scar), I'd hardly be able to tell there was anything wrong or untoward whatsoever! However, on close inspection with a pocket-torch, I can still make out the abnormality, a circular area of pearly skin with a slightly reddened central crater at the site of the biopsy. To me at least though, there are things about the site that look positive from a healing standpoint. The whole thing is flattening out and looking more like 'normal' skin, almost on a daily basis. There also appears to be little, if any, outward spread of the legion itself since applying the soda paste. What I am hoping for is another one/two reddening and crusting-over episodes before surgery date, then take another day or two off soda paste applications to allow the area to dry up and flake away as already stated. If improvements in appearance continue to be as evident as they have recently been, I might even drop into my doctors and ask for a re-assessment. But obviously, that's a long way off yet, and I am trying not to get my hopes up at this relatively early stage as I realise I might yet have to mentally prepare myself for a whole chunk of disappointment as far as the outcome is concerned. This is cancer, after all! I really don't care if this tumor hangs around for many more months. I realise that any healing with alternative and more natural remedies is going to be a slow process. The question is, will the healing be complete? Only time will tell, I guess. But one things for sure, as long as I feel I have this sucker under control, I will be extremely reluctant to undergo surgery. As far as other suggested remedies are concerned, I'm definitely going to look into Bloodroot and ammonia. As for vinegar, I am a little confused because surely it is bound to induce an acidic environment that we all hear cancers thrive on? Same goes for apple cider vinegar. I think I'll stick with alkalinity as it does appear to be bringing about some positive changes right now. Yes, sorry, but I don't have any pics right now as I don't own a camera/smartphone and the camera on my laptop is on the blink. The dermatologist took a picture on my initial assessment prior to biopsy and I might ask for a copy should I see her again. I might try to borrow my moms camera on my next visit to her. Thank you both again for taking an interest in my topic. I realise that there are many people in far worse situations than myself, many with multiple and more serious tumours that may very well be beyond being curable. My heart and thoughts go out to those people as well as my prayers that those folk will somehow get better, or at least get their illnesses under control to a decent degree. As far as the case of the old lady is concerned who had the tumor on her head, yes, that is where I got the idea from to try the soda paste remedy. There are many many different write ups about this one particular case all over the internet. With the sheer size and extensiveness of the tumor itself, personally I am not surprised it returned, as sad as it is to say. I will also look into purchasing pancreatic enzymes. Interestingly, I have been taking small daily doses of sodium bicarbonate orally for over 2 years now in order to relieve the mild acid reflux I have been suffering from for some considerable time now. I actually think my system might well already have been in an alkalised state to some degree prior to beginning topical soda paste treatment. Maybe this goes some way to explaining the (seemingly) fast positive results I (so far) have been seeing? I'll try to get some photos up here in the near future.